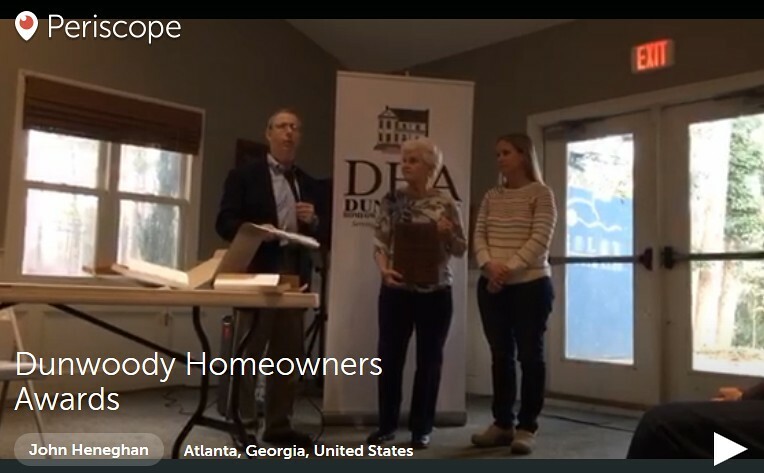 Videos from the Dunwoody Homeowners Assoc Meeting, Congressman Tom Price, GA Senator Fran Millar, awards & overview. Award presentations to UPS, Bloom Orthodontics, Dennis Crean and the naming of the Parade Grand Marshal. I have learned that the Periscope videos once uploaded are only available for a limited time, therefore if interested please watch sooner rather than later. 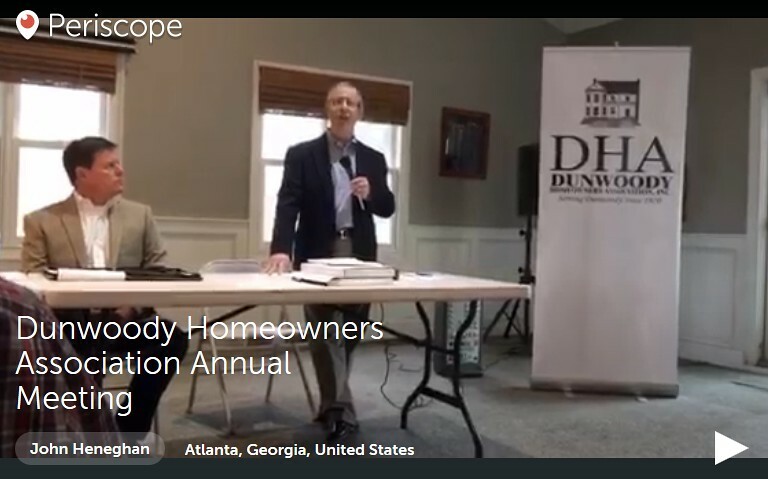 Please join your community for the Dunwoody Homeowners Association annual meeting this Sunday, January 31st at 4:00pm at the Kingsley Racquet and Swim Club at 2325 N. Peachtree Way, Dunwoody, GA 30338. 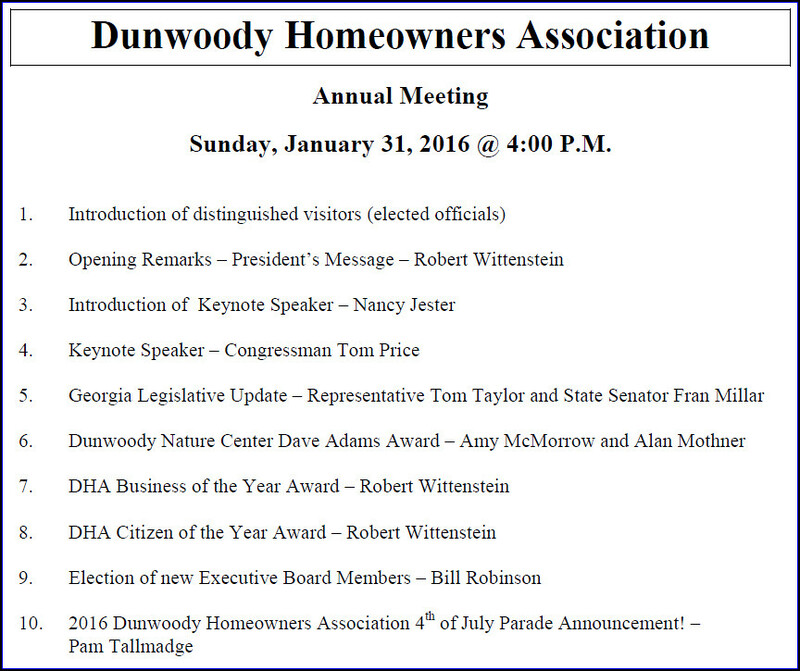 Congressman Tom Price to speak at DHA annual meeting on Jan 31 & DeKalb School Superintendent to address Dunwoody community on Feb 9th. The Dunwoody Homeowners Association has arranged two speakers to share their thoughts with Dunwoody residents. 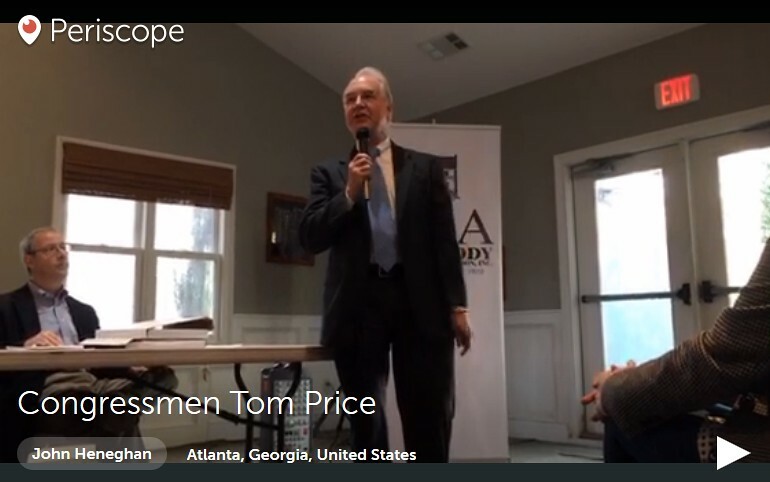 On Sunday, January 31st, Congressman Tom Price will speak at the DHA’s annual meeting at 4:00pm at the Kingsley Racquet and Swim Club at 2325 N. Peachtree Way. On Tuesday, February 9th Dr. R. Stephen Green, Superintendent of DeKalb County School System, will speak at 5:30 p.m. at Dunwoody High School. Both events are open to the public. Please mark these events on your calendar and plan to attend. Socialize with your friends & neighbors. 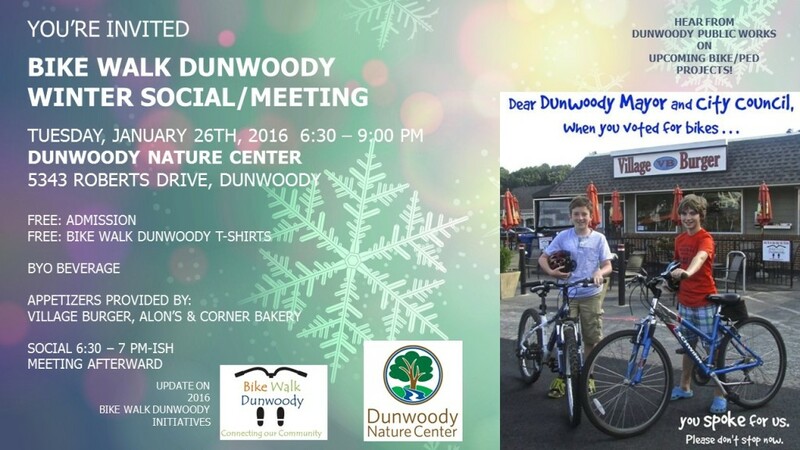 Learn about upcoming projects in Dunwoody that support human-powered movement. Provide input and collaborate on our 2016 initiatives. 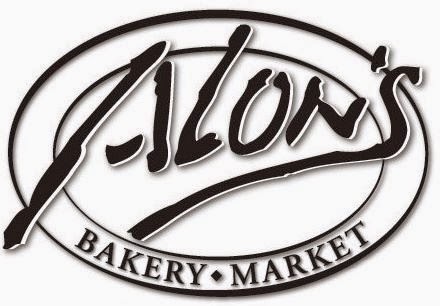 Appetizers: Thanks to Village Burger, Alon’s and Corner Bakery, we’ll have appetizers to share. Our Social/Meeting is open to the public. Please invite your friends & neighbors. Safe Routes to School – Partnering with our K-12 schools. Encouraging and supporting these efforts. Monthly Community Bike Ride – Starting back up in March. Efforts to increase awareness & participation. 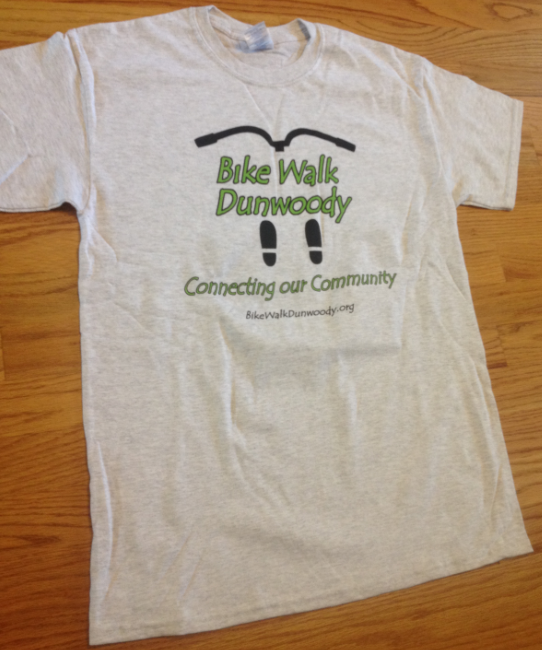 Fundraising for Bike Repair Station – Bike Walk Dunwoody is raising funds to have a bike repair station installed at the trailhead at Brook Run Park. Consideration of Pole Attachment Agreement with Mobilitie. Approval of Financing and Participation in DeKalb Municipal Association. A cooperative city strategy when working with DeKalb County is in our best interest especially when there are ongoing issues that affect all residents of Dunwoody therefore I am in favor of continuing our partnership with the DeKalb Municipal Association. 2016 Service Delivery Strategy discussions are about to start - 2014 Service Delivery Strategy - Dunwoody - 2010 Service Delivery Strategy - Dunwoody. 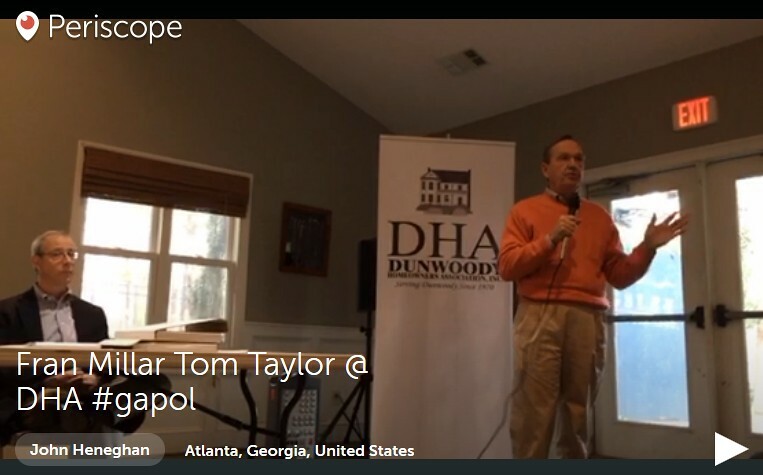 Dunwoody Town Hall Video courtesy of the Periscope app on my phone. 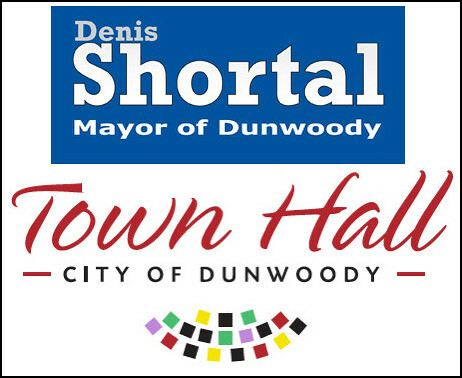 Above is a video of the second half of the town hall meeting hosted by Dunwoody Mayor Denis Shortal. While attending the town hall and sitting in the front row recording the meeting in the usual fashion, I decided that shooting several hours of video to be converted to a YouTube format and uploaded to the web was going to take quite a bit of time so I decided to switch over to Periscope which is a video service offered by Twitter. At the start of the parks discussion, Periscope went live and my 2,000 twitter followers were notified that I was streaming. Within seconds I had 10 people watching online and people were commenting on the content so I stuck with it for the next hour. It seemed to work well except for my jerky camera moves and getting caught by my viewers for attempting to prompt the mayor on a topic but over all it turned out well as I was lucky that I had a good internet signal. The schools will be on a shortened schedule so enjoy the long weekend and as there was a protracted discussion at the town hall on the subject, one resident would like me to remind you to please remember to keep your cats inside - at all times. Below are the public comments (tied back to an identified person) requesting topics to to be discussed at the Town Hall Meeting being held by Mayor Denny Shortal. There were other comments raised and I am not sure they will all be discussed, but below are all very interesting perspectives that I thought I would share. Please come out to the town hall to share your priorities with the new Mayor and other elected officials. As per one of the suggestions, I am personally unable to live stream from this location but may be able to shoot some video clips as I believe the City will record and post the entire event. 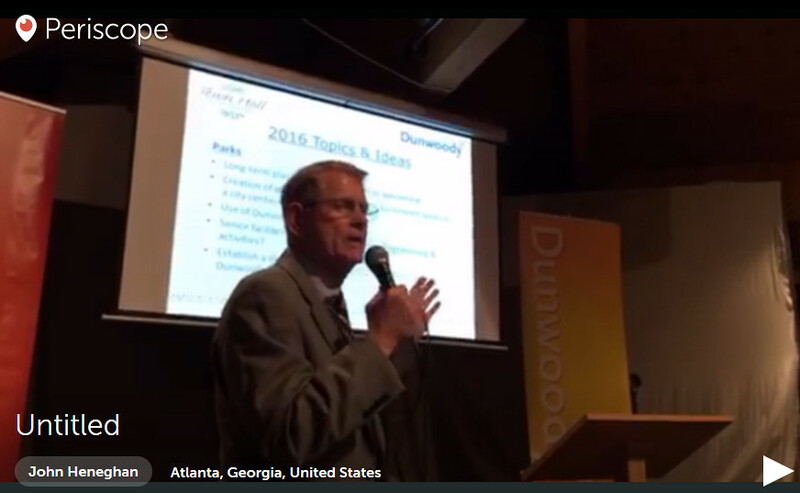 What topics or issues would you like to have discussed at the City of Dunwoody Town Hall 2016 event on January 21? 1.) Lowering speed limits on several main roads and collector roads from 35 MPH to 25MPH. I don't understand why roads with high density residential are 35MPH (i.e. Womack Rd, Tilly Mill Rd, Mt. Vernon Rd., etc. ), whereas other roads such as Ashford Center Pkwy are 25MPH. Speeders are going to speed, so we might as well make it easier for the Dunwoody Police to catch them. Unless there is a reason for keeping the speed limit to 35MPH, Dunwoody should do an impact study on lowering the speed limit for certain city roads. 2.) Several intersections are in need of a serious redesign. These include the intersections of Chamblee Dunwoody Rd & Womack Rd, Chamblee Dunwoody Rd & Mt. Vernon Rd, Tilly Mill & Mt. Vernon/Mt. Vernon Pl, and Chamblee Dunwoody Rd & Peeler Rd, among others. As urbanization and density ultimately spreads from the PCID further East into town, these road intersection improvements become detrimental to alleviating congestion bottlenecks. For example, the lack of a dedicated left turn lane on Womack Rd heading onto Chamblee Dunwoody Rd (Southbound), combined with a poorly designed entrance/exit into/from the Dunwoody Library makes for very dangerous driving conditions. 3.) Raising Dunwoody's current hotel tax (I believe 5%) to the maximum allowable (I believe 8%) is a "low-hanging fruit" opportunity for the city to collect additional tax revenue. The lodging demand is already here and hotel occupancy rates continue to remain high in the area. Essentially, people (or their respective employers) will pay due to demand and location. Barring any major political roadblocks, this is a no-brainer and should be prioritized accordingly. 4.) Revisit any current legislation relating to noise ordinances and related enforcement hours. Several loud vehicles/motorcycles can be heard at late evening/early morning hours as these drivers speed through several neighborhood roads including Chamblee Dunwoody, Vermack, Womack, Tilly Mill, Mt Vernon, Roberts, etc. with their loud motorcycles or modified automobiles. 5.) Continue to explore the feasibility and viability of Dunwoody adopting its own school system (I believe it would require an amendment to the Georgia Constitution). 7.) There was a rumor that Dunwoody was considering painting the Dekalb County water tower at the intersection of Mt. Vernon and Ashford Dunwoody Rd. Is this still up for consideration? 8.) Really would like to see continued prioritization and progress on the Dunwoody Village master plan. This is the core of our city! Would like to see less emphasis on retail banking (there is an undeniable overabundance of banks) and surface parking lots, and more emphasis on improved green space. 9.) Dunwoody's police force is one of the city's strongest assets. We should continue to fund the department appropriately and add more officers on the streets given the anticipated increasing density due to new commercial, retail and residential development. 10.) Partner and improve the relationship with Georgia Perimeter College (now part of Georgia State University) to make it a mainstay educational institution in the area. Ensure that any future plans the university has incorporates the voice of the city of Dunwoody and its citizens. All the zoning entitlements in the Perimeter Center area from 10 years ago are getting much closer to being financed and built as the economy recovers. Sandy Springs has been collecting millions in impact fees for the thousands of multifamily units they have approved up against Dunwoody’s western border. 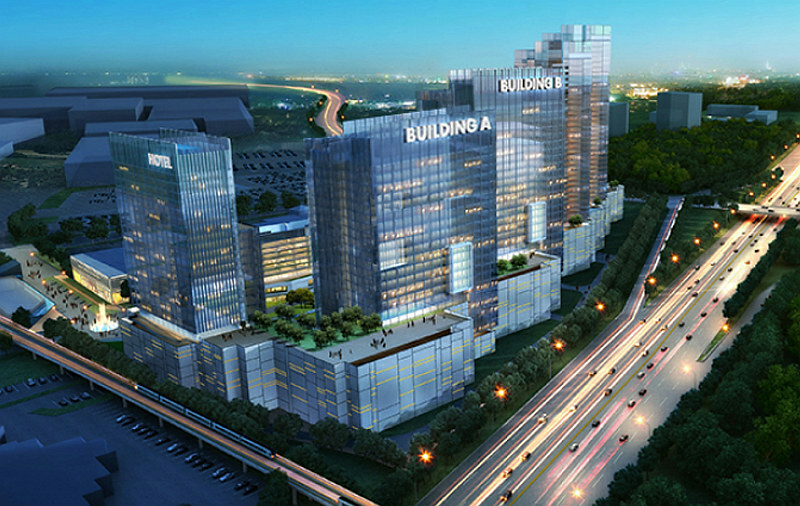 Dunwoody will lose several million dollars in fees to support traffic improvements and fund Park land acquisitions near the Mall; if impact fees are not put in place for the Perimeter Center Overlay district before the property owners submit applications to the city for land disturbance permits (to start the building process). Impact fees will not scare off developers; the fees will just help us deal with future growth. The last Mayor said he loved impact fees when he was running for office; but made sure it never was on the City Council agenda during his years in office. I expect more than lip-service from our new Mayor on this subject. I have always been ok with the schedule the first city council adopted: to repave all the Dunwoody roads in a 20 year cycle, then start over… I heard a lot this last election about accelerating that paving schedule. Is there a consensus among Mayor and council as to how much more money to throw at paving and how much would it shorten the original 20 year schedule? I’d like to hear about the Cities current Capital Improvement Plan for the next three to five years. Our infrastructure needs are not limited to more paving. We’ve outgrown the original space leased for City Hall. 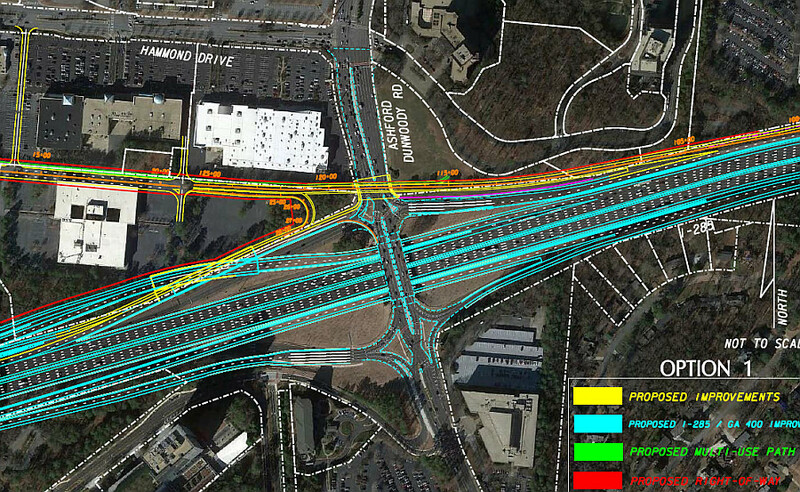 I do not want to go down the “build a big government complex like Sandy Springs” road. 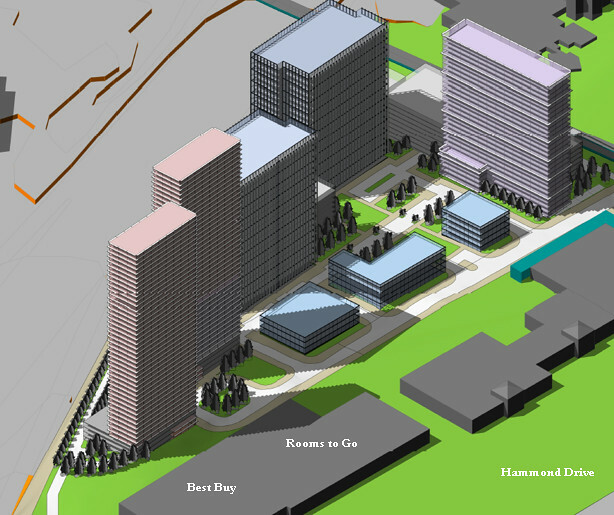 I expect we will continue to rent; but will it be more space at building 41 or a move to somewhere else in Dunwoody? I would like to see Mayor and Council set up Citizen Stakeholder committees to advise council on issues like a Parks Capital Improvement plan. We should do the same for issues like City wide Broadband, City of Dunwoody school system. Could the Parks division please develop a coherent and long-term plan for Winwood Park? Work on this park has been done piecemeal and with no apparent development objective. Last year, the parking lot was partially dug up and then left as dirt for 6 months before a small section was repaved. The delay forced visitors to walk through an often muddy area to access the sidewalk. In 2014, eight trees were planted within the existing canopy with no apparent aesthetic design. These trees, which likely cost several thousand dollars a piece to purchase and install, are now indistinguishable from the forest. Last October, the open field was ringed with trees. This is a park that is already 90% forested and the city is plating trees in the only open area. Furthermore, once these trees grow, the view of the children's park will be obscured, making families feel less safe. Please hire a designer and develop a long-term plan before spending more tax dollars on our park. 1. Dunwoody City Schools If the state legislature were to approve a school district in Dunwoody, do we know if the same tax exemption regarding county school taxes for those 62 years of age and older under would still be feasible to maintain in a city school system? Each fiscal year since the city's inception the Dunwoody Police Department's budget and number of personnel has increased. I understand that initially it can be a challenge to determine the appropriate resources for public safety in a newly formed city. I was wondering that now that the city has been operating for a few years if the DPD has developed a strategic plan with initiatives, goals and anticipated needed resources, costs of resources and funding of resources for the next 3-5 years? If so, where is it available? If not, shouldn't one be created? Road maintenance is a somewhat basic service of city government. Understanding that Dunwoody inherited a massive backlog of needed road repairs, are there financial funds available or could funds be re-directed to accelerate the current very extended plan to repave roads in Dunwoody? What % of the annual city budget is held in the reserves? What projects being discussed are not as basic as decent roadways in the city that funds could possibly be re-directed? Although much of the city's operations are outsourced, recognition of those who serve the city either internally or externally should be celebrated, rewarded and appreciated in a public manner in which the citizens can be made aware and share their appreciation for their professionalism, dedication, service and commitment to the citizens of the city. Most people observe what is valued, promoted, appreciated, recognized and rewarded by their employer and act accordingly. My 2 cents. Thanks. Heavy transient traffic from Spalding Rd. feeding into Chamblee-Dunwoody down to Roberts intersection creates a hazzard for local residents trying to exit subdivisions throughout the day with many cars exceeding the speed limit. For 100 yards South of Redfield on Chamblee-Dunwoody there are patches in the road that have been poorly repaired by contractors. Please fill them in to provide a safer passage. I would like Dunwoody to consider installing its own broadband network. I would also like to have a discussion related to the crosswalk on Chamblee-Dunwoody Rd at the Redfield neighborhood. Have a live video feed via YouTube, Meerkat, Periscope, Vimeo, etc. Listening via streaming media is the only option many of us have to be informed of the conversation. I'd also like to recommend accepting follow-up questions and commentary via Twitter or similar social media. Again, this may be the only way of receiving real-time feedback from the demographics that are not able to attend in person. When will the video on the agendas/minutes management system on the city website be upgraded to function in all browsers (instead of just Internet Explorer) and on mobile devices? Dunwoody High School Wildcat Royale & rising 9th Grade Football meeting. 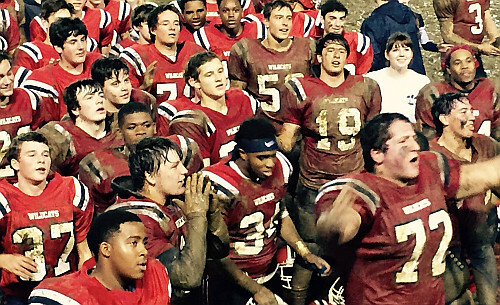 PS: Tonight (Thurs) at 6 PM is the meeting for the rising 9th Grade Football Team and I am looking forward to meeting Coach Nash. 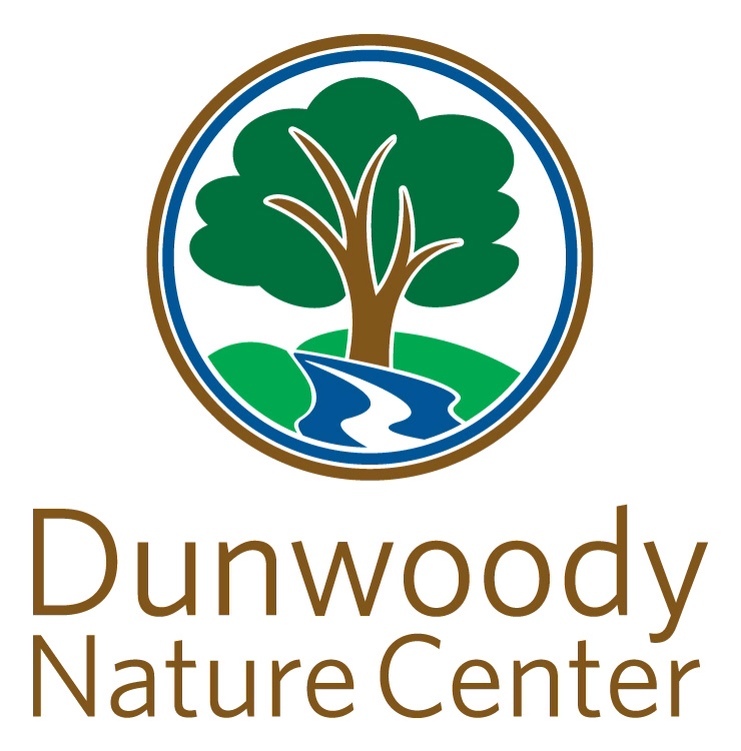 The City of Dunwoody is updating its Parks and Recreation Master Plan Update to guide future growth for recreational facilities and activities over the next several years. This will be a critical component of the development of future facilities, programs, and services. 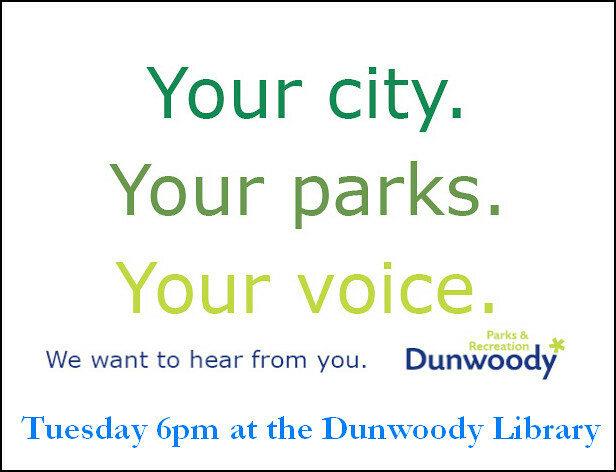 The city will host a public forum meeting open to citizens on January 12, 2016 starting at 6:00 p.m. in the Williams Room at the DeKalb County Library - Dunwoody Branch (5339 Chamblee Dunwoody Road, Dunwoody, GA 30338.) Your answers and opinions are very important to us as we plan our future growth for recreational facilities and activities over the next several years. Attendees and participants will discuss a series of topics and questions related to the city’s parks and recreation future. Your input at this public meeting enables us to collect valuable information to shape your parks for your future recreational needs. 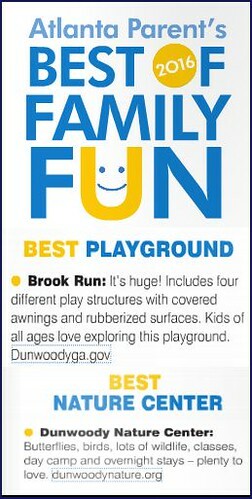 This an update for all Dunwoody Parks & all sections of city. With the accumulation of additional park land on Perimeter Center East this space now has more possibilities and there has been discussions regarding a park under the Marta tracks near the Dunwoody Station. Should the City keep looking for new park opportunities? What services or amenities are missing from Dunwoody & surrounding cities? 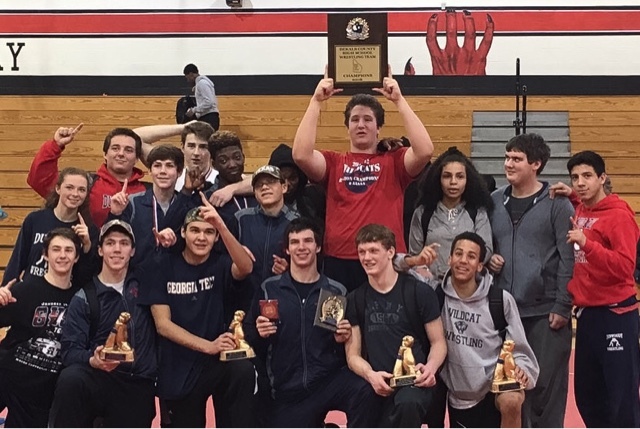 If you currently drive 15 miles away for girls gymnastics or can not find a kids lacrosse league, would it make sense for Dunwoody to offer those programs? We have a $4 Million dollar settlement with DeKalb that will be spent at Brook Run Park. Possible items missing from Brook Run are more restrooms, children's water features, basket ball courts, tennis courts, sand volleyball, picnic pavilions and a 1,000 other suggestions. We have 30 acres of open space at the back of the park - what is the best use of that space? We have proposed an IGA to partner with Peachtree Middle to maintain & use open fields - unsure of status of DeKalb School Boards approval? Austin Elementary is to be rebuilt on Roberts Rd with one option being mentioned is the site of Dunwoody Senior Baseball in Dunwoody Park. If Austin is built there, will Dunwoody Senior be able to play at Peachtree if the IGA or some other agreement is made? If we don't want to rely on partnerships to share land, should Dunwoody be looking to install large flat active play fields at the back of Brook Run for Lacrosse, Soccer and other field sports? Would it make sense to install artificial turf to maximize the hours of available playing time? If the back of Brook Run becomes active with playing fields, should they be lit for night time play? Public / Private Partnerships for more than just land sharing are also an option. If we wanted to donate or lease land to someone like the YMCA or the JCC to construct and operate a large gym facility in order to offer gymnastics or a natatorium; that could be done. The Brook Run Trail has been wildly successful, should the City be looking to expand this into a network of other paths? Should we be looking to connect neighborhoods where we can with such recreation paths? If so, where. Both indoor and outdoor public spaces are needed to offer various services and amenities. A Dunwoody City Hall conversation might be happening in the coming year and should we be discussing what we want in a City Hall as part of this current recreation discussion? Items that could be included in that public building might include a Performing Arts Center as well as a Senior and Community Meeting Spaces. Please attend on Tuesday and make sure you voice your opinions. 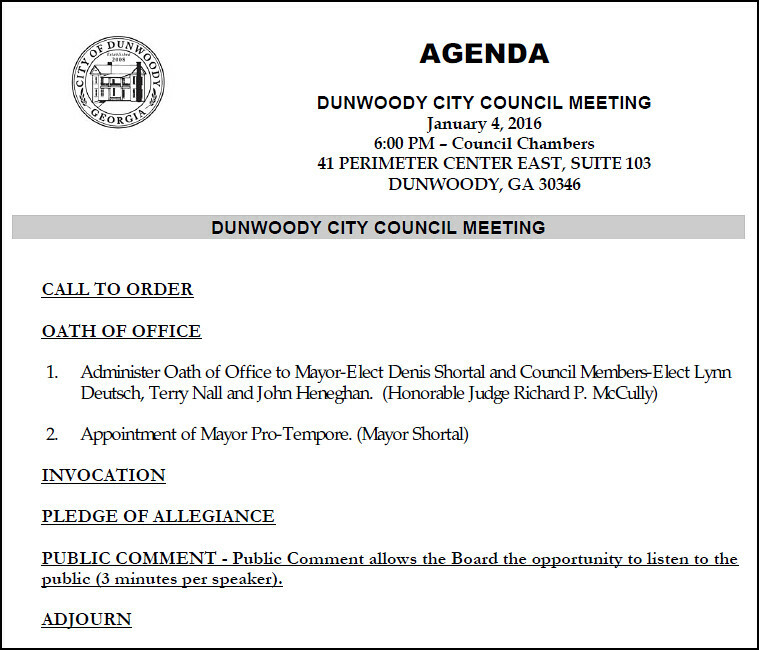 Dunwoody City Council Meeting on Monday to cover very light agenda. Earlier this week, I received a call from a well known respected developer who has had a string of successful Atlanta area projects on his resume including Atlantic Station & Lenox Park asking for a meeting because he wanted to brief me on a proposed project before it became front page news on Friday. After work on Wednesday, I met with Mr. Charlie Brown, Mr. Doug Dillard and others from their teams to discuss their preliminary plans for a large 380 unit development consisting of owner occupied units (with up to 10% rental) to then be followed up with other office buildings. They informed me that the Gold Kist site (behind Best Buy & Rooms to Go) was in play and that they wanted to rezone the section of the property closest to the corner of Ashford Dunwoody & I-285 to build one or two residential towers of high rise condos (shown in pink below) with one of the buildings having a high end hotel at the bottom as well as one additional building of retail. 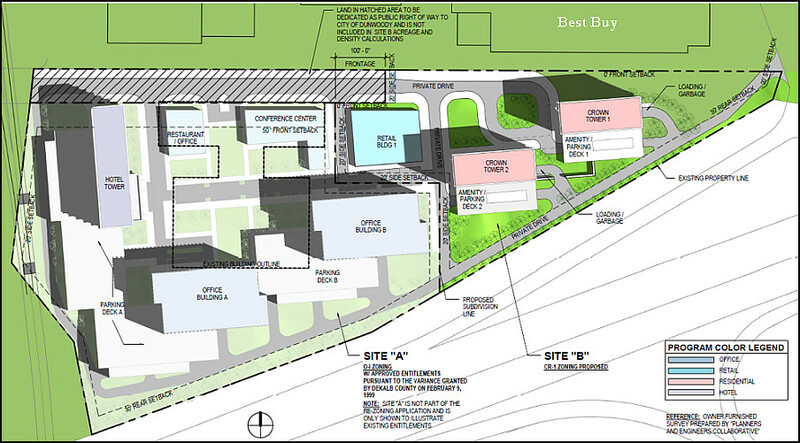 The rest of the site already has the zoning in place for office buildings, retail, convention space and even a separate hotel tower so the only thing they are proposing in this first segment of the development is the rezoning request for the residential towers. I think the meeting lasted a little more than an hour and as this was a preliminary filing where a thousand things could change before it comes back in front of me as a sitting City Council member there was a lot of back and forth. We discussed zoning mix, rental vs owner occupied, school impacts, live work play, transportation impacts, green space, connectivity with paths, LEED certified buildings, LCI, convention space with a possible large auditorium, connectivity with Marta, the 285 / 400 interchange improvements and finally something that wasn't shown on any of the drawings, the Westside Connector. There are two very big unknowns in this project and both revolve around transportation. The first is associated with the 285 / 400 project as the final right of way drawings have yet to be released and if this section of the property is squeezed or narrowed by a right of way taking, there may only be room for one residential tower. If that happens, the developer would like to build just one 40 story tower (six stories larger than the King & Queen building at the Concourse) with a hotel on the bottom third of the building. The second unknown is the fact that drawings provided by the developer do not take into consideration that there are plans on the table for a $20 million dollar Westside Connector proposal that I believe should be an integral part of this development. This is where there would be a tunnel under Ashford Dunwoody for a lane traffic coming off Westbound 285 at Ashford Dunwoody connecting directly on to this property and it would serve as a connection to Perimeter Center Parkway (State Farm and future High Street Development) and possibly to Peachtree Dunwoody. This same connector road would loop back and would tie in to directly to put traffic back onto 285 Westbound. Finally it is this connector proposal which would include room for a multiuse trail going from the Ravinia property, under Ashford Dunwoody and towards Peachtree Dunwoody and 285 where there will be a special lane in the tunnel for the multiuse path under 285 to the path coming up GA400 from Buckhead. Mr. Brown clearly stated that his firm would be willing grant the right of way from his property needed from the Crown Towers development to make the Westside Connector work but there are still questions as to the timeline for the approvals and the funding of the project. The conversations ended with a discussion that this was just the preliminary proposal and the project could morph and change in the coming months as the transportation items are determined, the full project is drawn up and presented at public meetings including a presentation of the Dunwoody Homeowners Association and the City's Planning Commission before it would be voted upon by the City Council. You now know as much as I do, but here is an AJC article which is also very informative and a slideshow of the photos here. 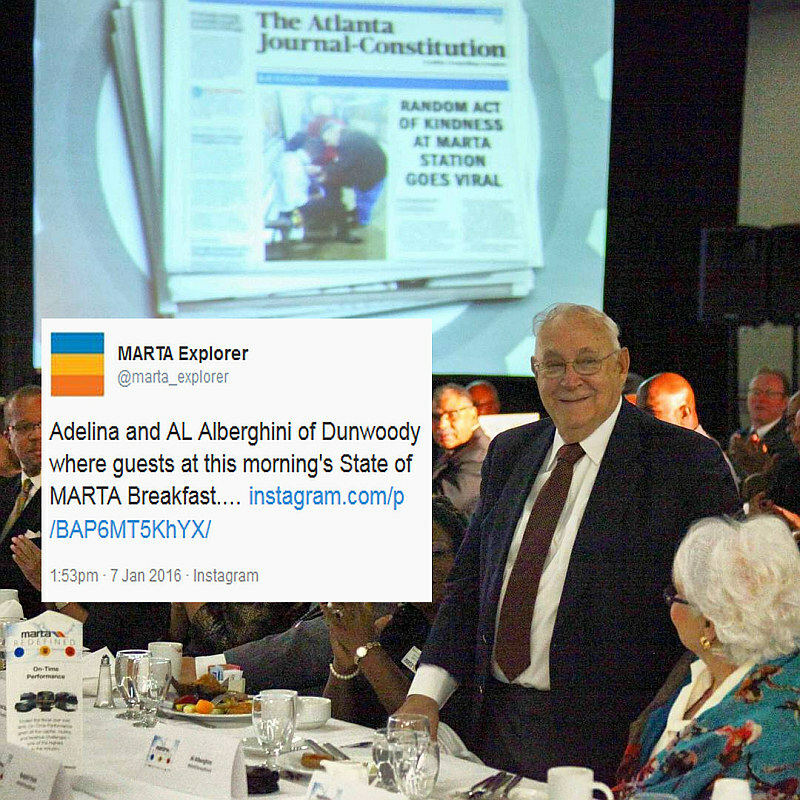 Al Alberghini of Dunwoody honored at State of Marta breakfast but we as a community actually owe him for a lifetime of service. Today Marta honored Al & Adelina Alberghini of Dunwoody after a simple photo was snapped of Al assisting a young man tie a neck tie on a Marta platform. The photo went viral and I think I first saw it when someone from Chicago posted the photo from the USA Today to my Facebook feed and I immediately recognizing my friend Al. 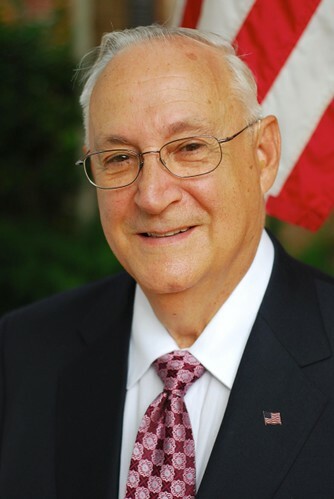 Many of my readers may not have heard of Mr. Alberghini before this event but please do me a favor to take a minute to read Al's bio that was posted on my website in 2008 when Mr. Alberghini ran for the initial Dunwoody City Council after the start of the new City. Going viral for a simple act couldn't have happened to a nicer guy but to be honest, both Mr. & Mrs. Alberghini deserve to be thanked for their many selfless years of service to this community as they have added so much. Al / Addie, if you are reading this, Thank you! Thirty-year Dunwoody resident Al Alberghini formally announced his candidacy for the Dunwoody City Council, District One designated seat. Alberghini notes that his entire working career involved ‘start-ups’ in the plastics industry, from his first position as a project engineer at a small research and development company and culminating with his most notable achievement: conceptualizing, developing and producing the world’s first 2-liter plastic beverage bottle and bringing it to market, the project that brought him to Atlanta in 1977. Alberghini’s efforts in leading the conversion of products previously housed in glass containers (among them instant coffee, salad dressings, peanut butter, BBQ sauce, etc., etc.) can be seen and used in households around the world. His ability to bring together various companies and individuals saw business grow from $50 million annually to over $500 million annually during his business tenure in Atlanta. Alberghini holds 19 patents. He retired from corporate employment in 1990 to form his own consulting firm. Alberghini is recognized worldwide as a plastics technology expert and has consulted for major plastic machinery and resin companies on various projects. He has spoken at plastics seminars around the world and served as an expert witness on patent litigation and personal injury cases. Alberghini has been a member of the Dunwoody Kiwanis Club for nearly 20 years and received the distinction of Distinguished President for his tenure in that office. The Club has served Dunwoody for nearly 60 years, a major project being the construction of Murphy Candler Park. He has been involved in nearly every service project the Club has undertaken since he joined. 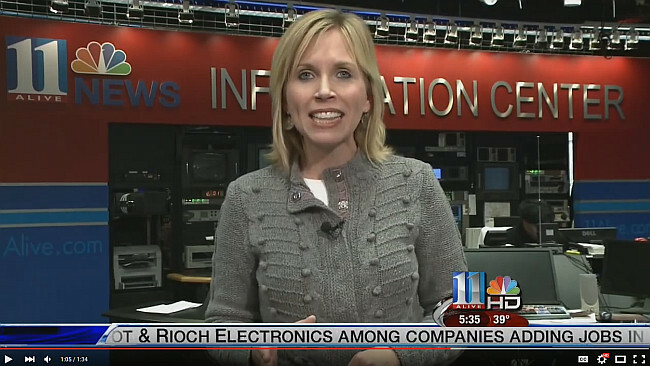 Alberghini also spearheaded the Computers for Kids effort that saw the Kiwanis Club re-cycle computers to be used at the (then) Peachtree Middle School in the Special Education classroom, which at the time had only one computer. Area business donated used computers, which Alberghini and fellow members “cleaned.” They then installed appropriate software for use in the classroom. The project served as the model for other Kiwanis Clubs in their local division to do the same thing in their neighborhood schools. He also worked after school each week with the Peachtree Robotics Club. Alberghini and Tysinger were among the Dunwoody Kiwanis Club members who painted the original map of the United States on the front sidewalk at Austin Elementary School and Alberghini can remember them both kneeling on the sidewalk “to get the Chesapeake Bay just right!” The map, which has been repainted over the years, is a reminder of Alberghini’s community dedication. Alberghini serves as technical advisor to the Dunwoody Kiwanis Club All-American Soap Box Derby, which is to be an annual event. He will conduct technical workshops for kids and parents who plan to build soapbox derby cars and inspections of those cars entered in the race. The date of next year’s race is TBA. The winner of this AASBD-sanctioned event will go on to compete at the national AASBD race in Akron, OH. Alberghini and former County Republican Committee Chairman Ray Warren, also a Dunwoody Kiwanian, were instrumental in helping to organize donations of “comfort items” for soldiers stationed in Afghanistan when one of the Club’s members, Captain Joe Urban (Ret. ), who was stationed there, sent word back that these items would be appreciated by his men. This led to another project, this time to outfit a local Afghan school which educates both girls and boys. The school had no windows, desks, chalkboards or other school supplies. These efforts led to Kiwanis Clubs statewide joining the efforts! Urban, a Dunwoody native, communicated with the Club and this time donations of basic school items were received from area schoolchildren and their families to help children they will never know receive an education. As a result of the many boxes of donations received, the US Army took notice and completely re-habbed and winterized the school. Alberghini served in Special Weapons at Sandia Base in New Mexico maintaining the electrical integrity of the fusing mechanisms of atomic bombs. He is a member of the American Legion. Alberghini holds a Bachelor of Science in Mechanical Engineering degree from the University of Massachusetts and an MBA from Western New England College. He is a Registered Professional Engineer. Taste of Dunwoody benefiting Children’s Healthcare of Atlanta - is always a great event that I highly recommend. Be a part of our annual 12th Taste of Dunwoody presented by Arrow Exterminators and enjoy an evening of food and fun benefiting Children’s Healthcare of Atlanta. 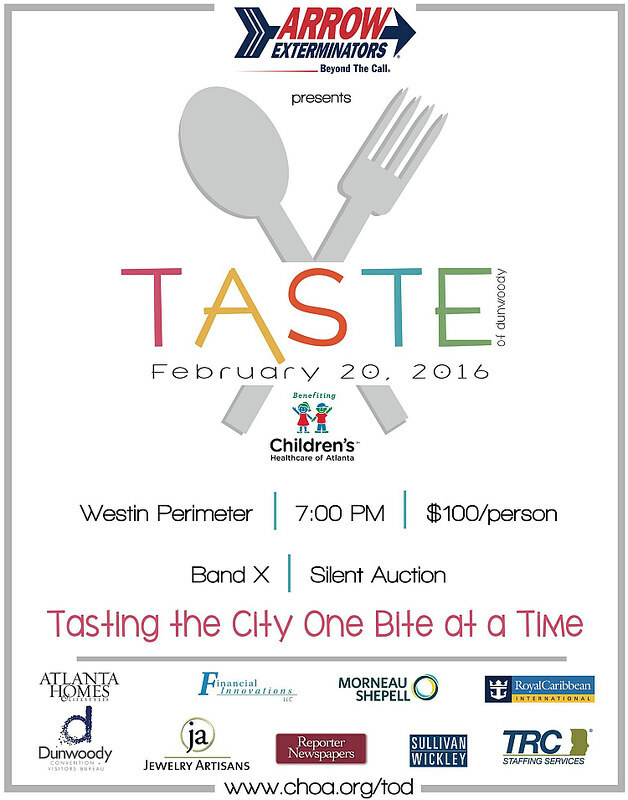 Featuring delicious fare from more than 25 Atlanta restaurants, a silent auction, a cash bar and live music by Band X, the Taste of Dunwoody is always a sell-out event. Tickets are $100.00 per person. 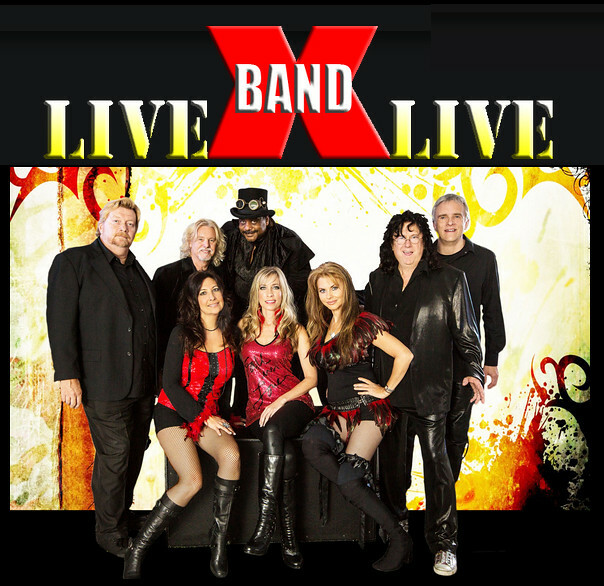 Band X is a high-energy group of talented musicians and lead singers dedicated to providing interactive live entertainment. Looking for adrenaline-charged show bands and things to do in Atlanta, or anywhere? Band X is Atlanta's Best Party Rock Band and just might be the foremost entertainers for Atlanta events and east coast entertainment on the US music scene today. With major touring experience, these professional musicians, dancers and lead singers electrify audiences, create entertainment news, and share the bands stage with some of the biggest attractions in entertainment music. Mayor Shortal and Dunwoody City Council Members Deutsch, Nall & Heneghan are sworn in on Monday. Communist Party reference in Georgia oath still raises questions. 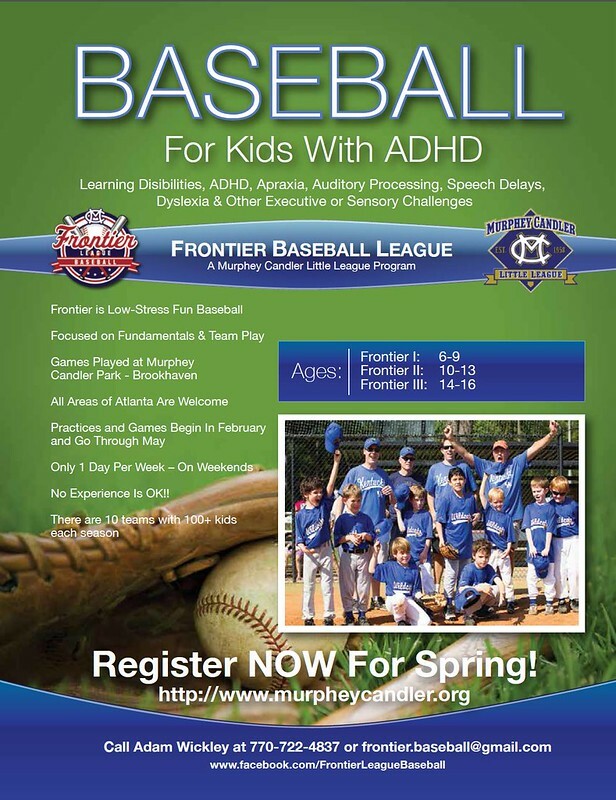 Murphey Candler Baseball early registration ends soon. Some of you may know that I have coached Frontier League Baseball for a number of years at Murphey Candler Little League here in Brookhaven and I wanted to remind the community that this is available. Frontier is low stress, fun Baseball for kids with Learning Disabilities, ADHD, ADD, Apraxia, Speech Delays, Dyslexia, Auditory Processing Disorder and other executive or sensory challenges. 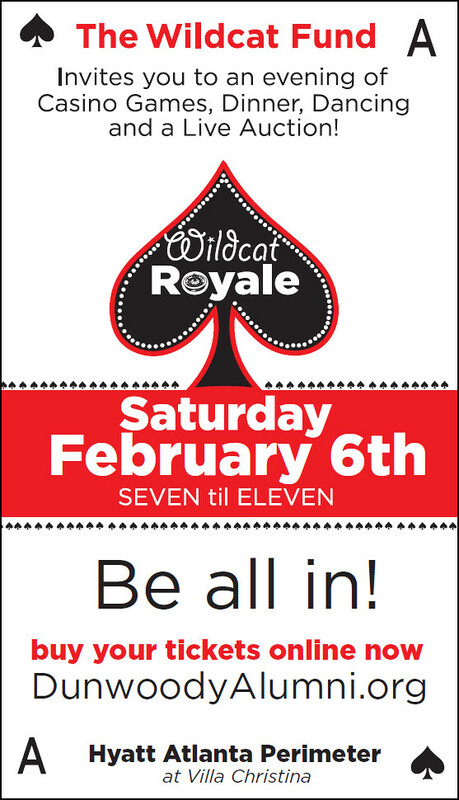 This will be our 6th season and this year the age has been extended up to 16! Please share this info and pass it on to other friends of yours who might be interested. For more information, go to https://www.murpheycandler.org/ and click on Frontier. THANKS!!! !